We love spreadsheets. And of course, once every four years, we also get mad about soccer. So why not merge both of them in to one awesome, frivolous and fun thing: Introducing…. The best part is you don’t have to run up to play this. Set your aim and let RANDBETWEEN() decide your fate. Few days ago, I saw a beautiful homemade science experiment on Sand Pendulums on Bruce Yeany‘s YouTube channel. Go ahead and check it out. It is a cool project to do with your kids. I will try this experiment with kids during school term holidays around Easter. 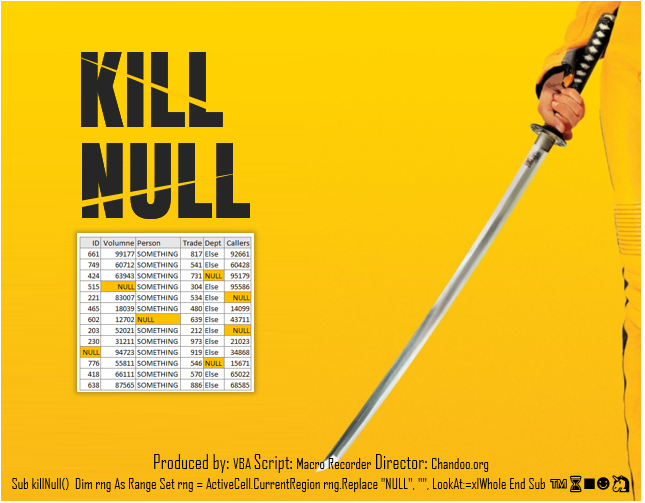 But first, I wanted to try the simulation in Excel. Take a look at the final simulation above. This is what we will create in Excel. I explained him how to do this while chewing mouthfuls of rice & veggies. But once I am home, I thought, “hey, maybe there are others out in the world who want to do this”. It is election time in USA, and that means there is a whole lot of drama, discussions and of course data analysis. There are tons of cool visualizations published on all the data. Previously, we talked about “How Trump happened” chart. Today let’s take a look at the beautiful decision tree chart by NY Times explaining what would happen if each of the 10 swing states vote for Democrats or Republicans. Go ahead and look at that chart. And when you are done playing with it, come back. My first thought after looking at the chart is: Wow, that is cool. I wonder how we can recreate that experience in Excel? But as you can guess, making a dynamic tree visualization in Excel is pretty hard. You can create a bubble chart mixed with XY chart to show all the nodes of the decision tree, but as this tree has 2^10 nodes at the bottom level (and 2^11-1 total nodes) our chart would look very clumsy and busy. So, instead of replicating NY Times chart, why not make our own version that explains the data? You can reuse this idea when visualizing outcomes of several what-if scenarios. Anyone who has made a pivot table and their grandma knows that formatting them is a pain. Let’s recap the steps to apply one of the most common formats – currency format. Unless you get paid per click, you wont be happy with all those clicks. Wouldn’t it be cool to just click once and apply most common format to your pivot fields? Of course you can. Just add oneClickCurrency macro to your personal macros workbook. And then add this to your Home ribbon as a custom button and you have a one click format option for any pivot. Around 2 months back, I asked you to visualize multiple variable data for 4 companies using Excel. 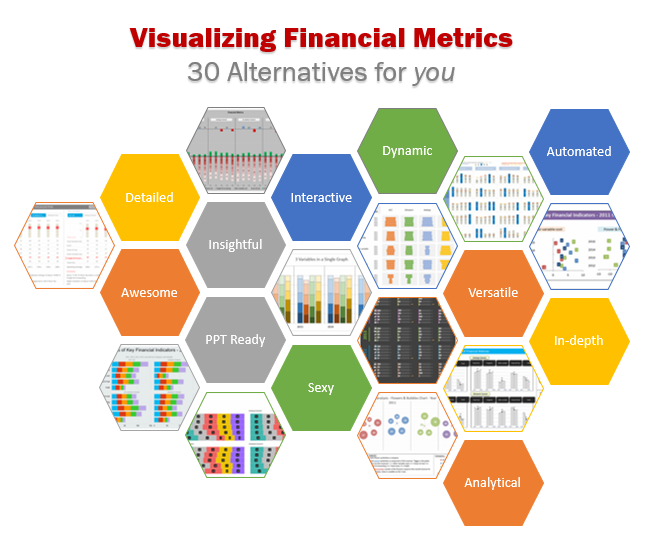 30 of you responded to the challenge with several interesting and awesome charts, dashboards and reports to visualize the financial metric data. Today, let’s take a look at the contest entries and learn from them. I am really sorry for the delay in compiling the results for this contest. Originally I planned to announce them during last week of July. But my move to New Zealand disrupted the workflow. I know the contestants have poured in a lot of time & effort in creating these fabulous workbook and it is unfair on my part. I am sorry and I will manage future contests better. So we moved to Wellington, New Zealand few weeks back (on 17th of July 2016, to be precise). After spending first 3 weeks in Jeff’s house and a hotel, we moved in to our rental home over the weekend (on 6th of August). Around the same time, the worst of Wellington winter waved welcome to us. We quickly learned how to stay warm indoors (layers, hot water bottles, rugs and more layers). Kids started going to school few days back and they are loving it. 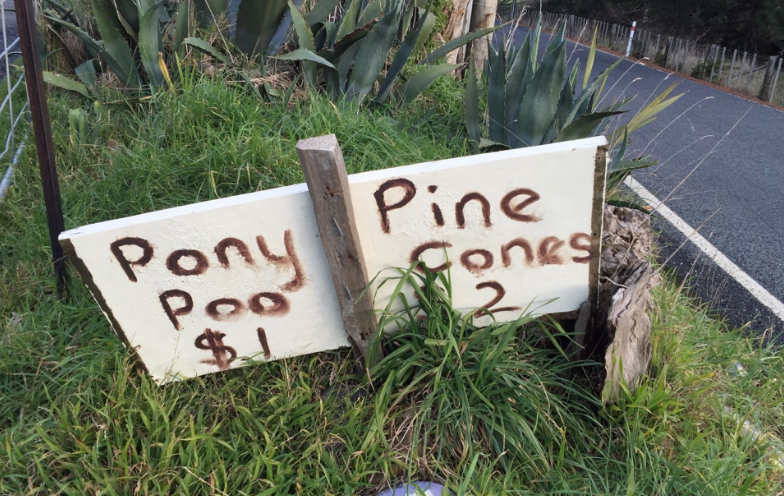 I bought a bike and managed to go out on few rides on the hilly roads of Wellington and found a strange for sale sign too. Anyhow, Since we didn’t have internet connection until today, I thought I will start by sharing a few Excel links with you. 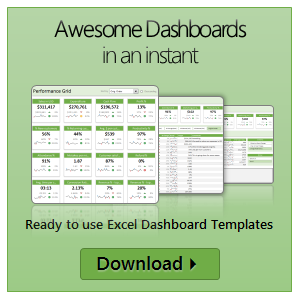 Check them out to get your fix of spreadsheets. This is third episode of our Monthly Master Class. 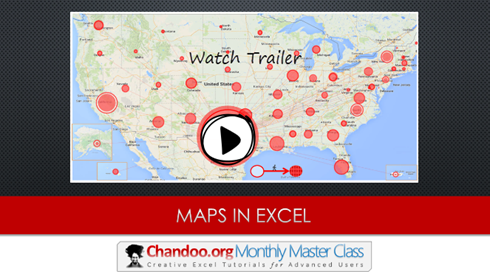 In this one, you will learn how to get maps in to your Excel workbooks. Understand 5 key techniques for making maps based visualizations in Excel – from regular charts to cell grids to VBA to Power Maps, everything is covered in this intense Master Class. My twins (Nishanth & Nakshtra) are now almost 7. They are super keen to learn how computers work. So the other day, I showed them Code.org where there are several coding exercises disguised as games. They loved those games … err coding exercises. 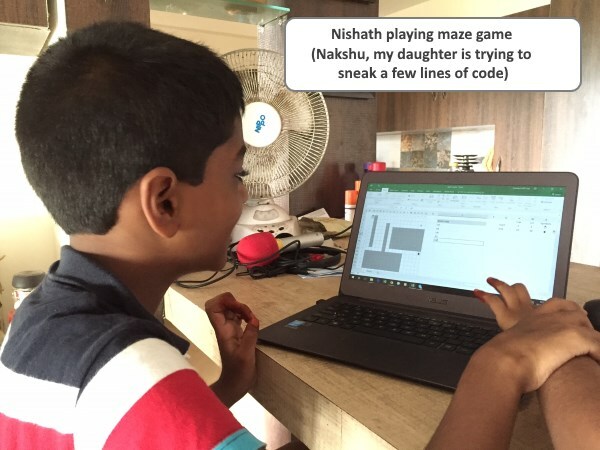 So that got me thinking… why not make a game in Excel that teaches kids simple programming concepts. So I built a Snowman & Hot Chocolate Maze game. In this post, let’s understand how to build such a game using Excel VBA. Recently I saw an interesting Earth Venus cosmic dance video on Facebook. See the original video below or here. Although this is not entirely accurate from physics & astronomy perspectives, the dance is a stunning example of patterns that are generated by simple things. I wanted to recreate this cosmic dance in Excel. How else am I to get my spreadsheet fix on a Saturday? Here is a quick demo of the final outcome. Read on to learn more about the Earth Venus cosmic dance. This is a guest post by Chirayu, a member of Chandoo.org forum. Animating Charts in PowerPoint cannot be done without the help of 3rd party software’s that create a flash file of the chart & embed it into the presentation. However there is a workaround for this. Save your chart as multiple images & insert them (overlapping on top of each other). Use VBA on Developer tab Controls such as Combo Box, Option Button, Check Box etc. to “Bring To Front”” the corresponding image. 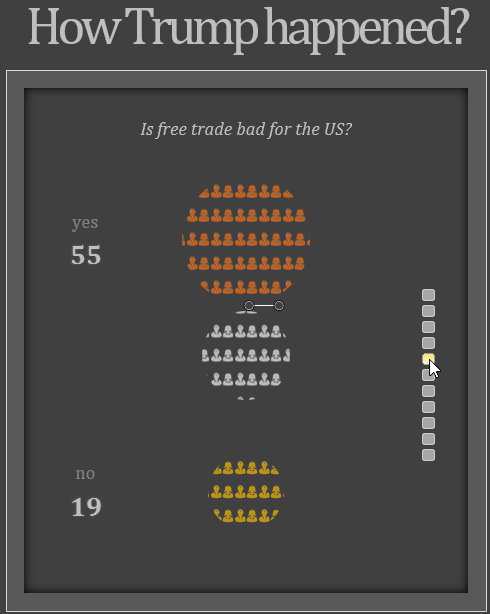 Thus giving the illusion of an Animated Chart in PowerPoint. Read on for awesome visualizations and full explanation.